Last Sunday was the global celebration of the Reformations 500 year anniversary. This is one of the most memorable events in all of history in that it re-established the truth of the salvation of man from sin only through the Grace of God and only in Faith in Jesus the Christ. But what was not often spoken of in congregations regarding the Reformation is what it means socially and politically. The Reformation also challenged the rightful authority of kingship of humans and re-established the existence of the only rightful hierarchy of political authority again being in King Jesus. The story of this plays out in the siege of Magdeburg and the Magdeburg Confession – One little city holding out and winning against the ‘Holy Roman Empire’. It is also about the true understanding of Romans 13 and the Doctrine of The Lesser Magistrate. You see, the Founding Fathers of America understood every aspect of the Reformation. Samuel Adams studied theology before he studied law. He had a clear understand of these Principles that are true from Genesis to Revelations and every aspect of governance in the context of corruptible human kind. As it is noted well in the references that I’m attaching Links to, the conflicting proposition on Christian Resistance or Disobedience has been a long term discussion. My personal studies have concluded that if the early Church did not resist/disobey the Roman empire: we would not have Christianity today. If the Magistrates and Ministers in the city of Magdeburg did not disobey and resist against the Catholic Habsburg emperor, Ferdinand II, we would not have the results of a Reformation. Needless to comment is that Samuel Adams studied his Bible every day. 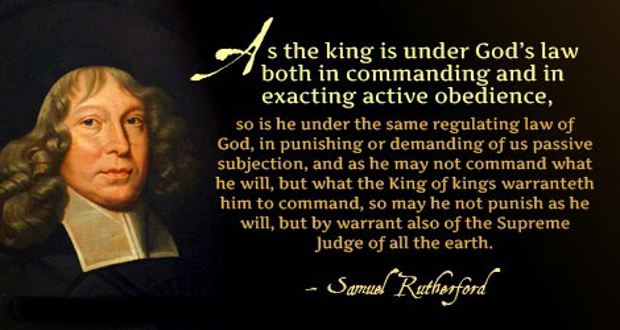 He was known as the “Last Puritan” not because of the way he dressed but because of his Biblical Reformation knowledge and non-bending principles. He understood Biblical Covenant and that God is absolute Sovereign over all things and that Jesus received the fullness again with the Father and Spirit in that Sovereignty upon his Ascension. As always, 45 minutes of radio cannot make up for hours of content. My hope is that this will get the brain cells and spirit moving. As I always say, there is not true Idea of Liberty with out Liberty given by Jesus. 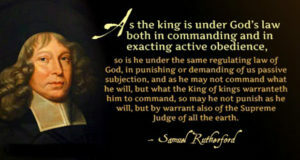 With that, there is no rational way to resist tyranny and despotism unless you understand what Sam Adams understood in the Biblical context of Resistance and Disobedience to tyrants.